You can also pre-order it from Amazon. For crafty green types who want to master the fundamentals of a scratch pantry and have graduated from simple weekend jam and baking activities, this book offers a wide variety of recipes and blueprints for artisanal food projects. Forty projects with accompanying recipes appeal to a range of skill levels and palates. D.I.Y. 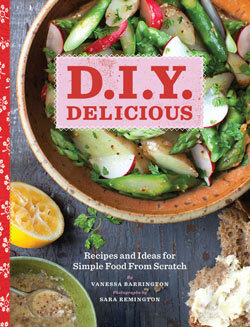 Delicious goes beyond pickling and preserving into fermenting, culturing cheese, and brewing sodas and tonics. A total of 75 recipes and more than 50 step-by-step, color photographs lead the way to outfitting a scratch pantry that uses fewer ingredients to make delicious staples at a much lower cost. Errata: Dear Readers, Due to a misprint, the recipe for Mascarpone Cheese on page 124 mistakenly lists cream of tartar as an ingredient. The correct ingredient is tartaric acid (available in cheesemaking supply stores). The recipe should read 1/4 teaspoon tartaric acid. Sorry for any inconvenience. Who would have thought a simple bean could do so much? 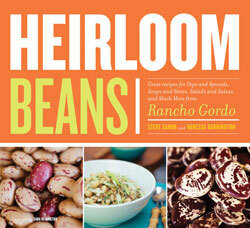 Heirloom bean expert Steve Sando provides descriptions of the many varieties now available, from Scarlet Runners to the spotted Eye of the Tiger beans. Nearly 90 recipes in the book will entice readers to cook up bowls of heartwarming Risotto and Cranberry Beans with Pancetta, or Caribbean Black Bean Soup. Close-up photos of the beans make them easy to identify. Packed with protein, fiber, and vitamins, these little treasures are the perfect addition to any meal.